The Victorian era was birthed when Queen Victoria took the throne of the United Kingdom in 1837 at the tender age of 18. It’s what happened throughout her reign and marriage that spawned the era. Queen Victoria was creative, adventurous, innovative and unafraid of trying new things. The era’s so-called “mother of feminism” launched a period of fashion that would last for over 50 years and become a worldwide phenomenon that still influences culture today. This Victorian era was essentially broken up into two periods: the early period (1837-1860) and the mid- to-late period (1860-1901). The early period’s fashion was characterized by ditching hats for bonnets, Gigot sleeves which “collapsed” around a woman’s arms and dresses which showed off a woman’s neckline. Skirts were worn so that they poofed out like an umbrella from the waist on down. 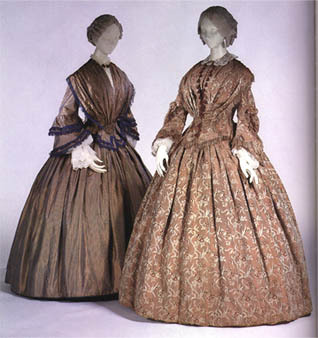 The mid-to-late period, however, was characterized more by “Princess line” one-piece gowns, which eventually evolved into dresses with trailers, that being that parts of the formal dress lagged (better known as “trains”) behind the woman wearing it. These were designed to showcase a woman’s figure, especially if that woman was slim and trim. Other characteristics of this period were mutton sleeve legs, brightly-colored dresses and tailor made suits that women would wear. Those who wore traditional Victorian era clothing were considered among the social elite because they were taking after the Queen, who was of the highest social class. time, you can probably draw some parallels with modern day society, most notably with weddings. And “pure and immaculate” is what many brides desire on their big day. It’s why they wear a white dress, a tradition that emerged when Queen Victoria herself was married. For an example of this, think back to some of the characteristics in fashion during the Victorian era previously mentioned. Princess-like, one-piece gowns. Dresses that reveal a woman’s neckline. Formal dresses that featured a train. Now think of the last wedding that you went to and what the bride looked like walking down the aisle. There are probably many similarities, just with a modern day twist to it. Weddings are one thing, but every day fashion is another. Hence, fashion designer Jessica McClintock, the founder of Gunne Sax, which eventually became the internationally-known Jessica McClintock, after her namesake. McClintock is notorious for designing her clothing line after the Victorian era and this line continues today, but with a more modernized edge. Most recently, the fashion designer has released a clothing line featuring “lush fabrics, laces and heirloom styling” in which the blouses and dresses that make up the clothing line are Victorian inspired. The Victorian era ended more than 100 years ago, but its footprints can still be seen in homes. But there’s more to modern day Victorian era than the bricks that still stand tall today in many of America’s cities. There’s fashion, arguably the most significant trend that emerged during that time period, which continues to influence fashion designers and society today. This post was sponsored by: Wardrobeshop. very interesting. I definately do not like modern bridal wear though as most women, apart from those with a long, slender neck and neat bust end up looking like sausage meat stuffed into and spilling out, I think they are immodest and sleeves or a bolero are more in keeping with the idea of “purity” the sleevless shoulder showing look is slutty. I am not a fan of contemporary wedding fashions. I do appreciate the elaborate detailing of victorian frocks. People just do not take the time that they once did in designing clothes. 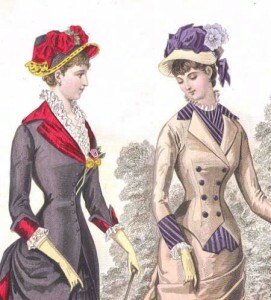 Victorian fashions were elegant. No other era can compare. I would like to hire/buy one English Ball Gown for an Annual event taking place here in South Africa,but my problem is that I don’t know where can I get one (frustrated). if anyone has information about this gowns, please contact me through my email nenebraidy@yahoo.com. It is good: Guest post: The Influence of Victorian Fashion on Modern Day …! Good! my daughter’s wedding dress seems to have some late Victorian influence…Was draped satin…with no extra decorations. Very flattering to anyone who wore it. (My daughter is tall & slender…but a short stout woman looked fine in the same style draped satin dress…) Dress has medium shoulder straps (which are part of the v neck bodice…draped satin imitates the v neckline…and there is a moderately full skirt which continues the asymmetrical draping. Had a short train also…which (like many wedding dresses) looks like the 1880s bustle just a bit. Noting that this 2012 dress seems to have reappeared (with slight changes) in previous and later issues of the Davids bridal selection…Guess a classic look lives on and on and on! (Noting also…women played tennis in bustle dresses…Hmmm maybe Daughter in Wedding Dress trying to Swing a Tennis Racket. Interesting photo op! great idea for unique christmas gift for her. Boyz very cool & trendy christmas gift for your girlfriend.